When you’re searching for the perfect spotting scope, there are many factors to bear in mind, such as quality and design, waterproofing, magnification and durability. The same requirements should also be considered when you choose a tripod for your spotting scope. Making sure the spotting scope fits the tripod can be challenging, but certainly not impossible. Above all, before you invest your money, you want to make sure the spotting scope and tripod work in sync. In order to get the most use and benefits out of a high-magnification scope, it needs to be stabilized on a sturdy tripod. These days, there are many tripods on the market and they are an essential accessory for many types of optical equipment such as spotting scopes, cameras, binoculars, cameras and telescopes. Steady does it. When using high-magnification instruments, you want to make sure you keep it steady, stable and intact. In addition you’ll want to support the weight of heavy or large instruments. Tripods have two main parts— a tripod head that can hold your optical instrument and a tripod leg set with extensions. Tripod heads consist of types of motions and weights it can support, and three main categories: two-way tripod heads, three-way heads and tripod ball heads. A two-way tripod head is commonly referred to as a camcorder head or video head. It is the most common and can move in both horizontal and vertical directions. Perfect for use with a spotting scope or video camera. In addition, three-way tripod heads add extra motion to the two-way head and can be used with many types of optical instruments and spotting scopes. A tripod ball head is just as it sounds–a head on top of a ball. They help the user to move the head in any direction with one swift motion. Tripods have three legs and generally can be collapsed into themselves, folded up and ideally fit into a backpack. Heavy duty tripods are more difficult to fold up. Tripods also feature plastic or rubber feet which may boast spikes or pins so as not to dig into the ground– especially useful for exploring rocky terrain or wet conditions. Tripod legs should also have extension features so they can be raised and lowered. 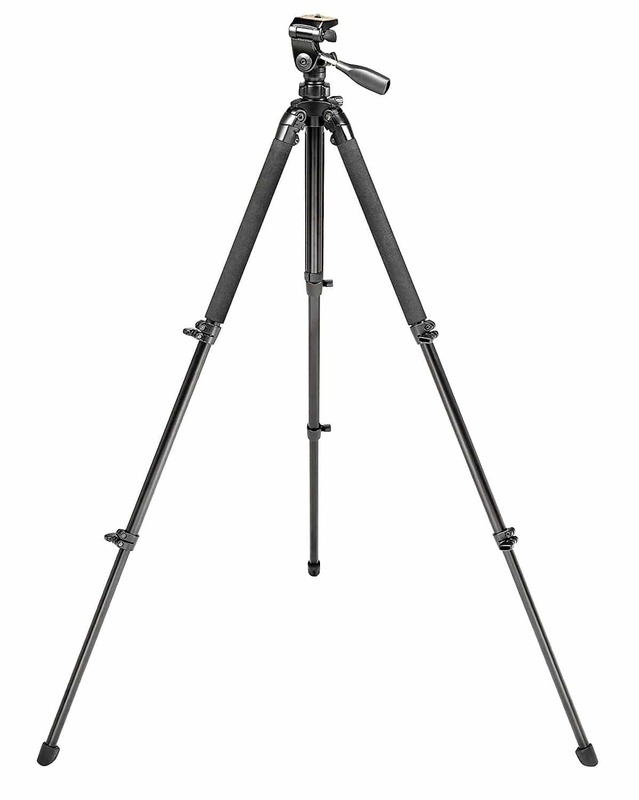 Tripods are a three-legged support for various types of optical instruments. And its job is to hold that instrument steady. A full-size tripod allows a person of average height to use a spotting scope, binoculars or camera while they are standing. For cautionary reasons, one should match the tripod weight and strength with the size of whichever optical instrument you are using, such as spotting scope, binocular or camera. A full- size tripod is one which allows a user of average height to use instruments such as spotting scopes, binoculars or cameras while they are standing. It’s best to match the tripod strength and weight with the weight of whichever optical instrument you are using. In addition, the larger the load on a tripod means the larger amount you’ll need to pay for said accessory. *TIP: Most full-size tripods at cheaper prices have plastic heads — these may crack and drop your expensive spotting scope on the ground. Do your research! The Bushnell advanced is a full-size tripod, ideal for viewing from a platform as it is a stand-up tripod. It’s also great for roadside or decks where portability is not essential. It can support up to eleven pounds of an optical instrument and features three padded foam leg cushions to add comfort/protection in extreme weather conditions. This full-size tripod’s versatility is key as you can use it for sitting and standing as well as for use at many other events. Neither the lightest, or the heaviest tripod, it’s somewhere in the middle, making it a great choice for a full-size model. In addition, its stable base allows photographers to view distant subjects at higher magnifications. The Bushnell advanced tripod comes complete with a universally compatible head that fits all spotting scopes, rangefinders and binoculars. Its high-quality materials make it extremely rugged and strong with adjustable legs, plus the corrosion resistant finish makes it extremely durable. If you’ve been searching for a full-size tripod and a suitable companion for a heavyweight scope, this is the one for you. Compact tripods are usually too big to use on a table, but are really comfortable to use while sitting in a chair. They are lightweight and sized just right for fitting into a backpack. Their portability and lightness is probably why compact tripods are favored by mountain hunters and backpackers alike. Compact tripods are generally the best choice for spotting scopes of 70 mm or smaller, as well as for digital point cameras. When you need something lightweight for your next hike, reach for the BeFree by Manfrotto. With 100% carbon fiber legs, this compact tripod can extend to 56.7 inches, supports 8.8 pounds and folds up to 15.75 inches. The tripod’s legs feature two-position leg angle stops and can be extended independently. The other benefit to this super light tripod is that its legs fold around the ball head — another feature that helps to make this tripod so compact. The tripod ball head has a large convenient locking handle with an included QR plate and sturdy carrying case for easy storage and transport. Out of all the different types of tripods, tabletop (as you may have guessed), are the smallest.They are designed to be used on a table or shooting bench. Depending on which model you are using, tabletop tripods are usually between eight and eighteen inches high. These tripods work great for smaller spaces, but are not recommended for holding a heavy spotting scope. Usually equipped with a small knob, it’s easy to make adjustments for wind and elevation factors. The Vanguard VS-82 tabletop tripod is a perfect choice for your next video or photography project when you only have a table to work with. It’s a lightweight, simple and compact tripod with a smooth two-way pan head. It has two-section legs and center column, and offers a maximum height of 9.8 inches. The non- slip rubber feet keeps this tripod in its place. This model is also great to use for a spotting scope. It has full 360 degree panning and front-to-back tilt. Lightweight in its design, it weighs less than one pound and is easy to slip in a purse, backpack or even a pocket! The adjustable tabletop tripod from Alpen is micro-adjustable, durable and features a quick adjust knob for fast target recovery as well as two fine-tuning adjustments to take care of windage and elevation. Stabilizing your spotting scope or camera without giving way to your precious mobility is a definite plus with this tripod. Its smart design is made to fit all spotting scopes and cameras with standard mounts and is equipped with a compact construction that fits easily in most bags and backpacks. 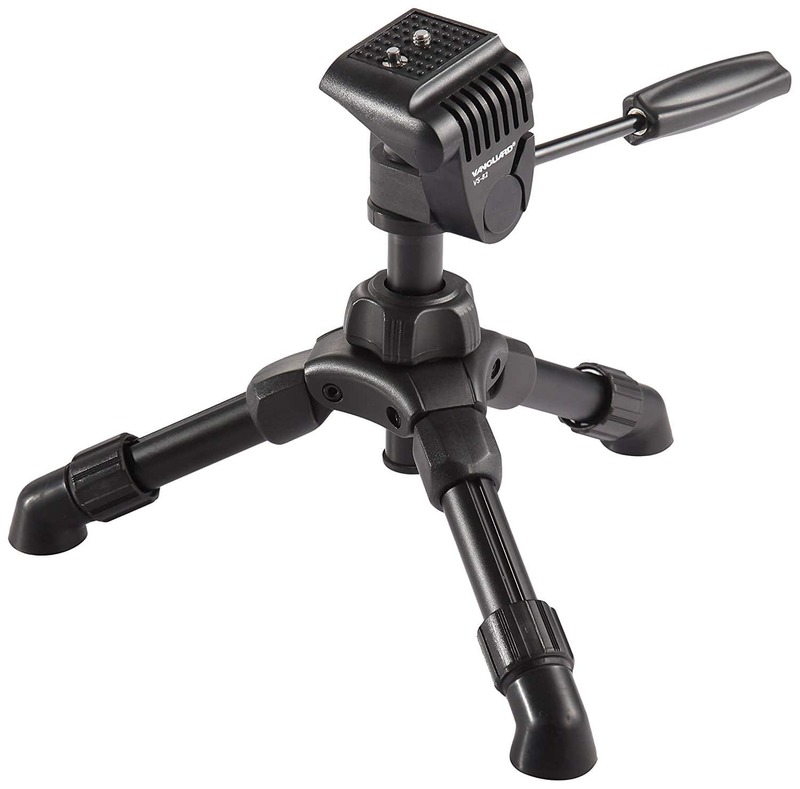 The Alpen micro tripod adjusts from 10 to 13 inches tall or up to 16 inches by moving the legs of the unit together. Guaranteed with Alpen’s lifetime warranty. Spotting scope tripods for hunting need to be sturdy and rugged, mobile and light, yet durable. You really need to do your research when you’re ready to purchase a spotting scope tripod for hunting. What’s the one thing that is invaluable to hunters? If you said quiet, you’re right. So it makes sense that hunters need a quiet tripod that doesn’t rattle or shake. Speed is also a necessity. Spotting scope tripods used by hunters need to be set up quickly and taken down quicker. Think lever locks. Another thing to consider would be weight and height (of the tripod) — hunters like to travel light and move lightly. Whether you’re using a spotting scope tripod to hold your rifle, spotting scope or even your binoculars, choosing a high-quality tripod is essential. Its height ranges from 24 inches to 67 inches making it a wise choice for sitting down and standing up. In addition to its fluid head, the center column is an added benefit when glassing with binoculars. 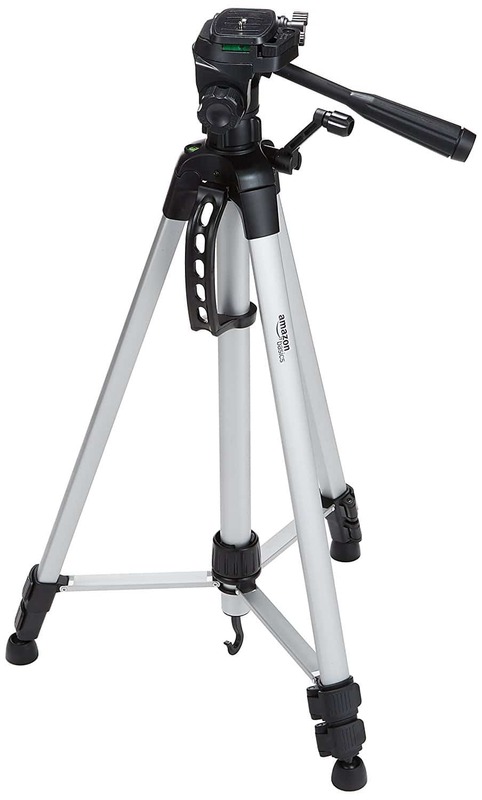 Perfect for an adventure with rocky terrain, this tripod comes complete with spring-loaded variable leg spread stops. It’s super easy to set the tripod legs where you need them for greater stability. The three-way pan head is smooth and ready for steady viewing thanks to its adjustable tripod height with easy to use leg locks. Mounting/switching optical equipment is simple and quick, which is so important for hunters. Based on cost, durability and flexibility, the Vortex Pro GT is without a doubt an excellent spotting scope tripod for hunting, and the most reliable for heavy-weight spotting scopes. So you’ve invested in a super quality spotting scope and you’re ready for your long awaited adventure. Surely you don’t want to secure it on any old tripod. But you don’t want to break the bank at the same time. We get it. 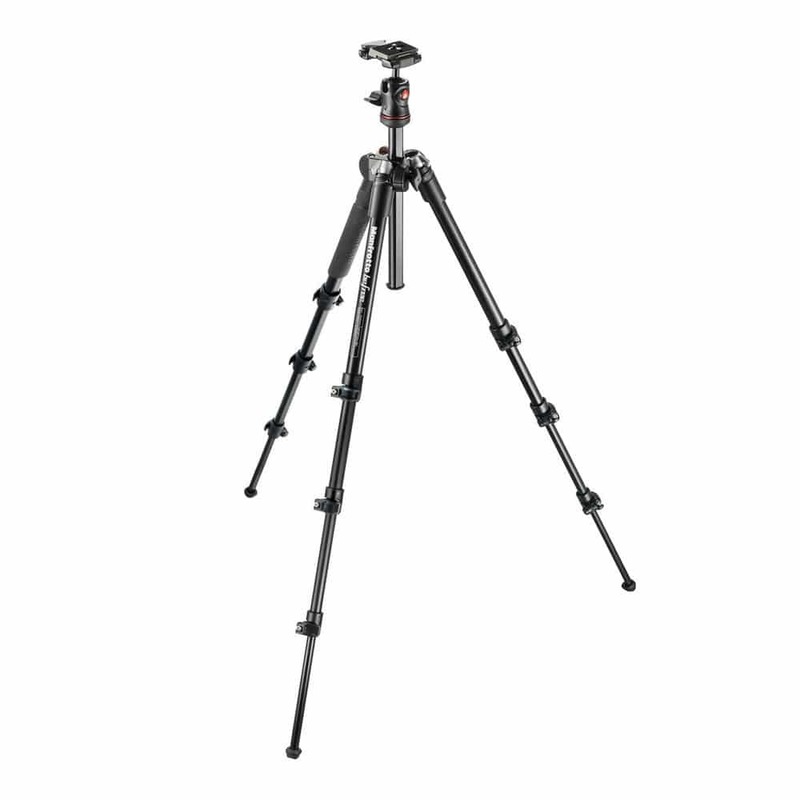 When it comes to searching for a tripod that is within your financial needs, the Carson TF-300 delivers. Although it’s on the cheap side, it’s still a quality-built product. It weighs a mere 3.2 pounds and when you hold it, you’ll feel both its lightness and durability. Very hard to believe for the price! The TF 300 is a compact tripod — perfect for hunters, birders and hikers alike. It has a maximum height of 62.6 inches and because of its lightness, it’s easy to put into a backpack. The Carson TF-300 provides a super portable and stable platform for nature observing, photography, digiscoping, birding or hunting. Its three-way pan/tilt head rotates 360 degrees with a lock that ensures the exact position. Two bulls-eye bubble levels secure proper leveling and each of the leg’s sections are adjustable with snap locks to make sure the height is set correctly. And just in case you need more height, the center column extends with a handy geared elevator for a swift and exact movement. The hook on the bottom of the column holds your backpack to keep it off of a soiled ground or in case you want its added weight to improve stability. The hook is also great if you need it for your binoculars or other optical instrument. 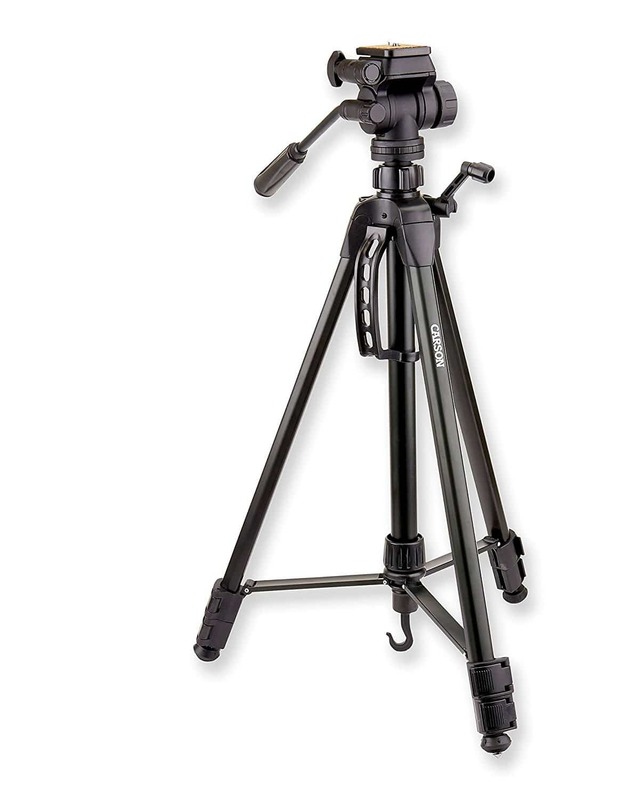 The TF-300 tripod is sturdy, durable and lightweight and the best choice for your money. In addition to the TF-300, Carson also has three other models, depending on your needs. They are all appealing in price and are consistent in their quality and lightness. First in the series is the TF-100 which is the smallest, most compact model of the four and has a maximum height of 20.7 inches. 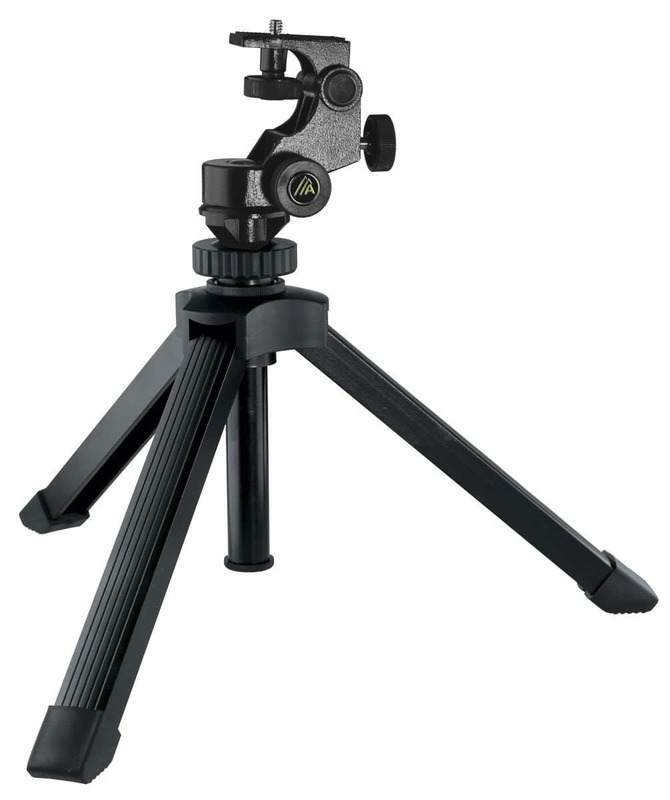 The TF-100 tripod is a tabletop version and excellent for outdoor use. 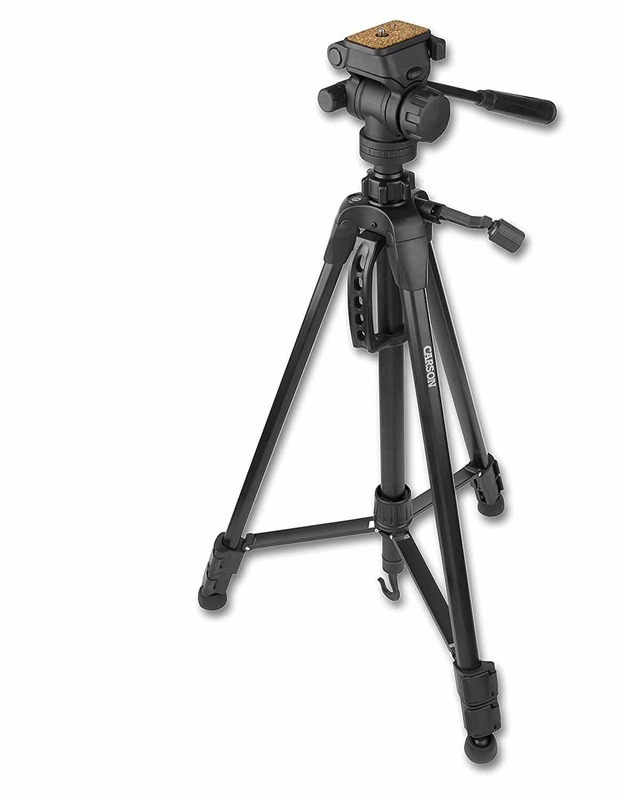 Just like all Triforce tripods, the TF-100 features three-section, aluminum locking legs and rubber non-slip feet. In addition, its three-way panhead is a great choice for birders and photographers. The TF-200 model comes in at 58 inches. It’s a professional tripod which extends to 58 inches. Rugged and tough, it’s the ideal choice for rough terrain. Features a geared elevator, three-way panhead and quick release shoe with two bubble levels. Also comes with a hook and a handle. An ideal choice for outdoor use, the TF-400 features aluminum locking legs, quick release locks and can extend to 65 inches. Your perfect view is guaranteed every time, thanks to its retractable spiked feet. Three-way panhead ensures a smooth 360 degree movement and with two bubble levels, your viewing setup is sure to be exact. The TF-400 also comes complete with a hook and a handle for the best portability possible. Sturdy, lightweight and great for all scopes, binoculars, cameras and camcorders! All of the Triforce series come with aluminum legs and quick release locks. Add to these key features a quick release shoe and you’re ready to quickly transition your optic from the tripod. Carson TF tripods are lightweight, durable and affordable. Plus, they’re 100% guaranteed with a lifetime limited warranty. This lightweight tripod is a great choice for consumers on a budget. And, it’s especially popular for those adventurers who like to switch between their spotting scopes, cameras, video cameras and digital cameras. It can hold up to 6.6 pounds and exhibits better all-around performance than other tripods that come with a hefty price tag. Portability isn’t an issue, as the AmazonBasics weighs a mere three pounds. 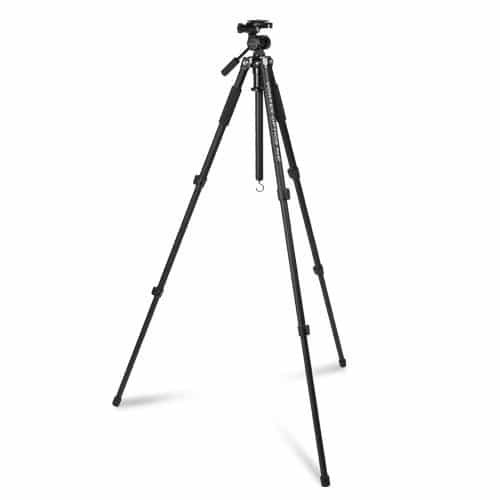 This tripod’s height can extend from 25 inches to 60 inches and features a three-way head which allows for tilt and swivel dynamics. In addition, it comes with a quick-release mounting plate and a smart carrying case. An absolute bargain!